Tomatoes in all shapes and sizes, forms and colours, (and just as they should be) are working their way on to my kitchen bench top. Some grown by me and some via my OOOOBY box. There has also been some Eton Mess experimenting done. This experimenting shall continue as much like the apple above, I was impressed, oh yes I was. Linking in with Ms Celia today and lots of other amazing kitchen goodies. This entry was posted in Food Glorious Food and tagged crackers, easy, kitchen creations, ooooby, recipe by cityhippyfarmgirl. Bookmark the permalink. Love the recipe! And i will soon have a proper house to live in, so will be able to actually try out the recipe. Looking forward to nibbles in the backyard, watching the sun sett! I don’t make my own crackers as often as I should – but I love it when I do – just chomping on supermarket crackers now! I saw caramel chocolate apples once and the woman tried to sell them to me on the grounds that they made children eat fruit but they were exorbitantly expensive and we had chopped apple in the bag that sylvia loves to eat so I just walked on by – nice idea but it does seem like apples are so good that these sort of apples always disappoint me. and never made eton mess but I made my own meringues for the first time so maybe there is hope! hooray for meringues Johanna…next stop Eton Mess. Do it. 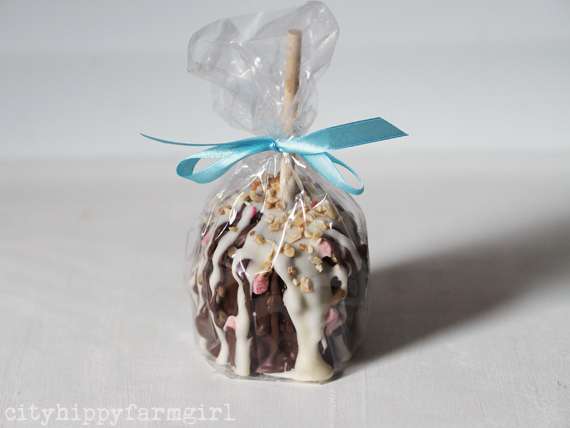 Hello heavenly chocolatey nutty coated apple! Remember the candy covered apples from our childhood? How disappointing were they when they were old and soft not to mention the toffee candy stuck to your teeth. Yay! to your eclectic mix of toms. 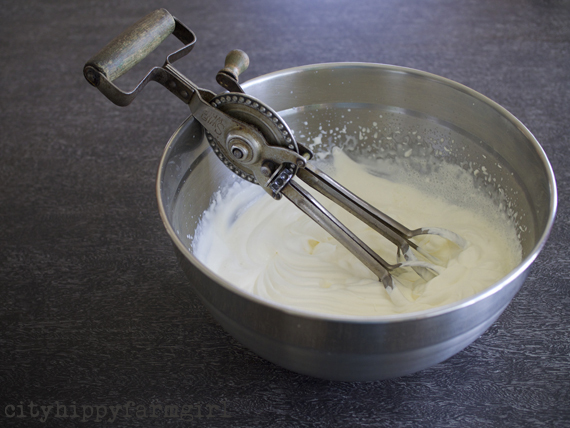 I only had a hand mixer till my mid twenties. I use to pass the mixing bowl around to housemates when my hands got tired. Everyone use to have a good laugh and it was nice way to collaborate. Zena I was half expecting the apple to be disappointing like those yuck toffee apple ones…I really had no expectations, except that it looked pretty. So I was pretty happy to find out, damn! It tasted good! Hand beaters do the trick all the time. Dessert and a work out…win, win. Yes, they are really similar. So easy right. My green tomato knowledge leads me to relish and THAT is pretty much it unfortunately. It’s something that I never have around me so I don’t play with them. My three prized tomatoes (best) tomatoes were taste tested by a despicable rodent type critter this week. I was less than impressed. How rude. I hope summer finds its place for a little longer in Tassie Narf. Come on tomatoes! I found a recipe for a green tomato jam with vanilla pods not so long ago. It looked amazing and came with a sterling Russian pedigree so if worse comes to worst, I will at least have an alternative to chutney, relish and fried green tomatoes ;). Oh BUGGER on the rodent scoffing your tomatoes! We have had something with nibbley little teeth chewing on the compost heap but I don’t mind that…so long as they don’t start on my pumpkins! Beautiful things going on here! Thanks for that cracker tip, definitely a must try. 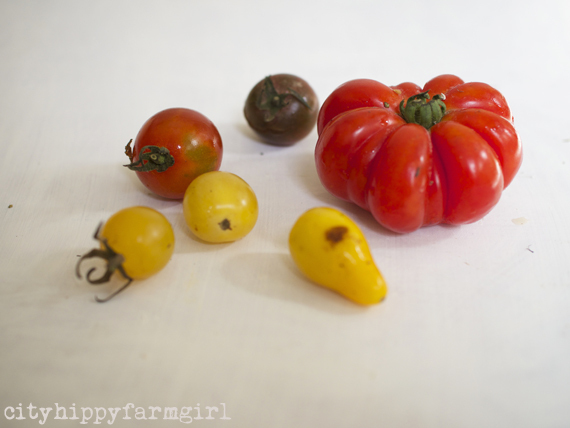 Yes, tomatoes of all different shapes and sizes on my window sill too. Just keep coming. OOOOBY sounds good, nice to see organic suppliers who deliver appearing more and more. Love those beaters, I can hear the sound of them as I look. Can’t wait to drag mine out of a box to display/use when I get a real kitchen. It’s a particular sound isn’t it. Growing up, that was the sound of good things to come that’s for sure. I definitely want to try the homemade crackers. Thanks for posting! Yes, I’ve seen apples like this, I’ve reviewed them – the jury is still out! Yes I’m a fan of eton mess and NO I don’t make my own crackers, but I jolly well want to try now. I’ve seen similar apples coated with sticky, chewy caramel toffee. I was smitten. And just a little nauseous after eating one. 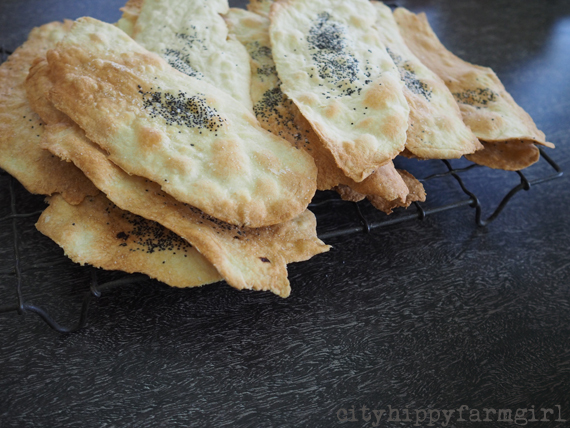 I’ve been meaning to make these crackers for AGES! Thanks for the reminder! I love homemade crackers. They are so much better that store-bought. They look yum. Brydie, I’ve made (and savored) olive oil crackers before — ‘regular’ and gluten-free — but never with the “add on’s” you suggested. (Goodness, I love IMK — thanks for sharing those ideas!) I also loved your “free form” cracker shapes. Snack time heaven. 🙂 As for chocolate dipped apples? Oh my! (Hope your chiropractic woes are over, too.) Thanks for your “tease” re: Eton Mess. I’ve always wanted to make (EAT) that! yep the add ons are a cracker! 🙂 So damn easy too. I laugh at the bought ones for $10 for 5 of the same thing.